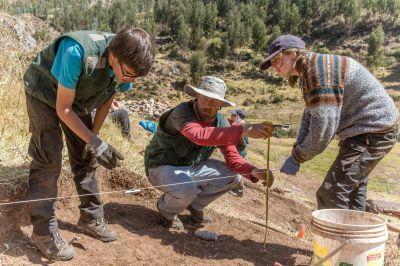 Volunteers on the Archaeology Project in Peru have recently begun excavation work at a new site in Cusco. 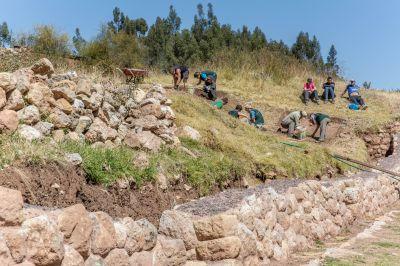 Inkylltambo, a sector of the Archaeological Park of Sacsayhuaman, is into its third year of excavations, and Projects Abroad volunteers have been invited to take part on the dig. Volunteers began digging in mid-July after being granted a plot of land for excavation through an agreement with the Peruvian Ministry of Culture, and excavations are expected to continue through October. The Archaeological Park of Sacsayhuaman contains a network of military fortresses and “waka’s” or religious sites created by pre-Incan cultures and later occupied and adapted by the Inca. The site of the current dig is thought to be another religious site within the park’s vast network. The park, located on the northern limit of Cusco, is found higher up the mountain so that it overlooks the city, thereby serving as a military stronghold for the Inca during the Spanish Inquisition and as a religious center. A series of temples celebrating the various deities of the Inca are found within the more than 3000 hectares of the park’s limits, and include temples to the sun, the moon, water, and animals. The volunteers are currently digging in an area of 28 square meters. Utilizing the Wheeler excavation technique, the site is broken down into a grid of 2 meter-square quadrants, and the excavation is being realized through the removal of caps of 5-10 cm. Though their excavations have been underway for a very short time, volunteers have already turned up bits of ceramic and bone as well as part of an Incan wall which is thought to be a part of the main structure. Following the excavation work, volunteers will have to record and analyzes all of their findings, which is projected to take place through December. This is done by analyzing the quality, designs, and material of the artifacts as well as the relation of the structures within the site. Excavations and artifact analysis are only part of the work that volunteers undertake on the Archaeology Project. The archaeology team works under three agreements with the Peruvian Ministry of Culture: one which covers the excavation work at Inkylltambo, one for maintenance work on the pre-Incan ruins of Pikillaqta, and the final which covers exploration and registry work in Pikillaqta National Park. Excavation work can only be undertaken during the dry season running from April until October, and during the rainy season, the focus of the project shifts to artifact analysis, site maintenance, and the mapping and registration of previously unrecorded forms and structures. The principal objective of the work being done by Archaeology volunteers is to be able to assist the Peruvian Ministry of Culture in the preservation of their national and regional heritage sites. The former capital of the Inca Empire, Cusco is rich in archaeological findings, and for the Peruvian Ministry of Culture, exacting the budgets to cover studies and maintenance of all of the region’s heritage sites is an impossible task. The ultimate aim of the project is for the data that is collected and the reports that are created to be used in future studies of the sites. Work on the Archaeology Project gives volunteers the opportunity to gain hands-on experience in every aspect of archaeology, from exploring new sites and mapping new structures to the excavation and analysis of artifacts. Volunteers become a part of the team lead by local archaeology experts: project director John Valencia Cordova and staff archaeologist, Delsi Espinoza Masias. Previous archaeology experience isn’t necessary, as staff on the project are eager to share their knowledge and are experienced with walking volunteers through the steps involved in learning how to map sites, excavate plots, and analyze artifacts. Because of the richness of Cusco’s archaeological history, volunteers are guaranteed to take away knowledge about Andean archaeological history. Find out how you can contribute to our Incan & Wari Archeology Project in Peru or take a look at our Classical & Medieval Archaeology Project in Romania.